Cub Scout Day Camp is a volunteer-run day or evening activity over three to five days. There are several locations of day camp throughout our council’s 15 county service area. Daytime camps usually run from 8am-4pm and evening or “twilight” camps typically run from 5pm-9pm. You’re welcome to attend any day camp, even if it’s not the one being run by your district’s volunteers. Remember, your “district” is the geographic area to which your Cub Scout Pack belongs; it’s usually defined by school district or county boundaries. Parents are encouraged to attend with their Scout and participate as a “walking Den Leader”. This simply means that you’re helping the other volunteers running the camp by supervising your Scout or Scouts. Plus, it’s a great way to schedule time with your child and watch them have fun (they’ll grow up before you know it). 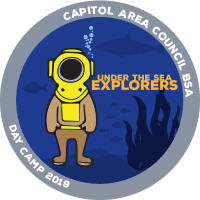 This year’s Cub Scout Day Camp theme is “Under the Sea Explorers”. The theme is woven into activities within each camp. Each camp will also offer traditional Scouting outdoor activities like archery, BB gun marksmanship, nature study, and water sports. Remember, you can attend any day camp, regardless of location. You can even attend more than one. Review each camp’s registration link below for specific information about dates, times, prices, and more.